Let’s say, for example, that you sell sneakers. When someone searches for sneakers on google, whose sneakers will show up at the top of the search results? And whose do you want to show up at the top? - yours. Let’s make that happen. What even is Google Shopping? First, let’s understand what Google Shopping is. It’s a collection of online product listings that redirect a buyer to a website where they can make the purchase. These listings come from online marketplaces and webstores. If you want your products to show up at all, you need to sign up for Google Merchant and send product data to Google too. Now we have our products on Google Shopping. How do we make sure people who search for sneakers are finding our products? We’ll go a little more in depth about each of those below. Managing these results effectively involves Google Analytics, regularly reviewing how people search for sneakers, what words they’re using, what words they’re not using, and the success rate of each search. Otherwise, your customer looking for some nice running shoes is going to end up wearing rainbow Gucci sneakers. Listing Quality - you have a webstore where you have product data and price, but then also create that listing on Google Merchant. If your webstore says the shoe is mesh but you type in on google as woven fabric then Google won’t be confident in your listing. If it can’t be certain the buyer will find the right product and have a good purchasing experience, then you’re listing won’t be a top result. Ensuring that you use a system that keeps your price, title, description, and other content sync’d between Google and the site it redirects to is important. CPC Bid - what are you willing to pay to Google if someone clicks through to your site? (CPC = cost per click). If the max you’re willing to pay is $0.05, than and identical seller willing to pay $0.06 is going to show up higher in the search results. The trick to this is that it might take 50 clicks to convert a sale. At that point you’ve paid Google $3.00, and that’s going to factor into your margins. If our sneakers are $19, that’s almost 16% of our revenue. How do we keep this number under control? Using a programmatic service can automatically adjust your price and CPC bid based on conversion rates and revenue. Monitoring the results diligently can maintain a commission range that you’re ok with paying. 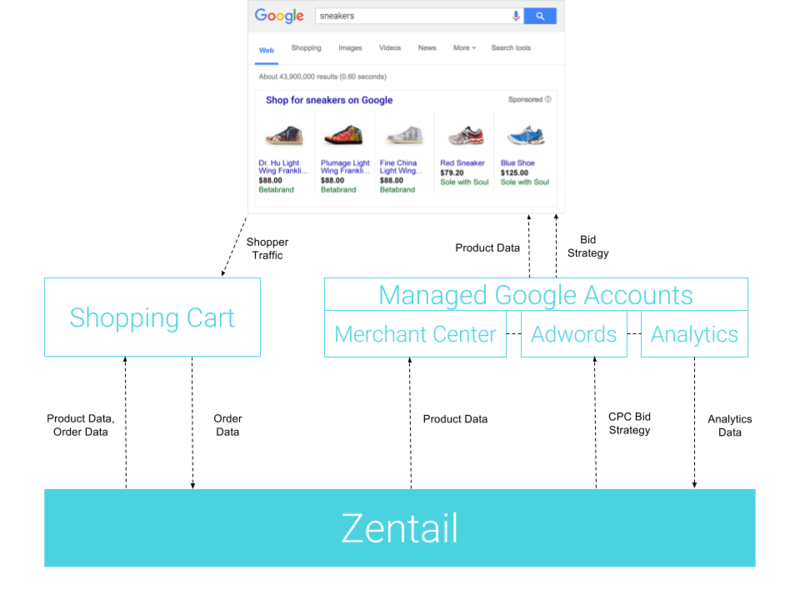 Zentails Google Shopping service is certified by Google, and monitors these factors programmatically to maximize your revenue, maintain growth, and minimize your costs. 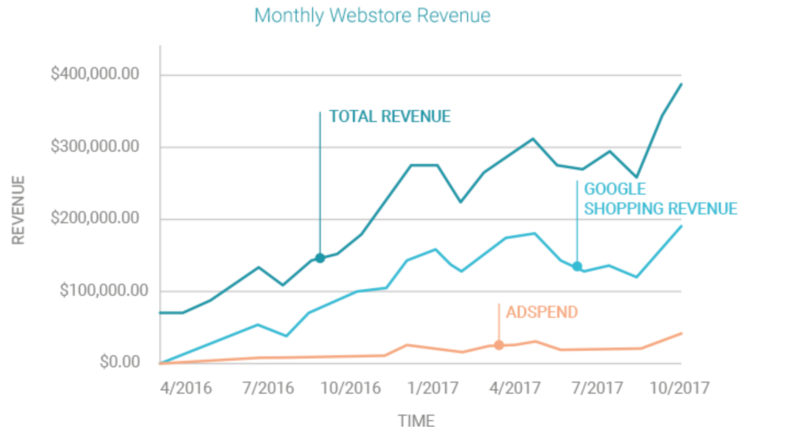 In short, to get your products to show up in search results, keep your costs down, and grow your revenue and customer base it’s important to use a reputable Google Shopping service. This is extremely difficult to do on your own without experience. Similarly, be wary of what you’re paying for a service. Some services charge a percent of ad spend budget (or CPC budget). That means that if you want to spend $100 on ads, $30 of it went to the service and only $70 actually made it to bidding. This is an inefficient way to spend your advertising budget. Our philosophy is that payments should be performance based to ensure the best use of your money, and align our incentives with yours (growing your sales while maintaining a reasonable ACoS).